On a sunny day in June, our Maine Knitting Cruise crowd took to the island armed with indigo dye and yarn. The process was magical, beautiful, creative, and a complete blast. Below is the best of the process start to finish. Ending with the yarn hanging over the wood stove for a final dry. Of course the day wouldn’t have been complete without an all you can eat Maine lobster bake too! Jackie passing out yarn for dyeing. Happy knitters taking a break while the water heats up. P.S. Our next knitting cruise is August 31 to September 5. If knitting is not your thing, try out the Maine Food Cruise – Cooking with Annie, July 6 to 9. – The most number of men knitting (including one who was 16 years old). Does 16 count as ‘man’? Not really probably, but any way he was at the knitting just like everyone else. – Somewhere it must be said we had the most number of “tinked” projects (things that had to be ripped out and started again), but hey, lots of beginners ups that ante and there was no shortage of laughter and camaraderie in the process. 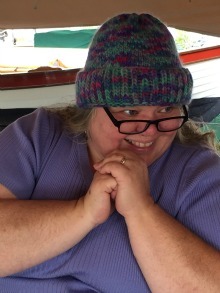 – Maine’s fastest knitter was with us and knitting her heart out. Thank you, as always, to the fabulous Bill Huntington for his knowledge, humor and gift of the craft of life through knitting. We are looking forward to seeing you again in July. Our next knitting cruise still has space! Mim Bird, knitting Queen, will be on board to for the newest to the most experienced of knitters. If you aren’t a knitter, come join us for a short sail anyway, knitters are a fun bunch to share time with. Last weekend over 40 of us gathered together with sewing needles and yarn to sew 141 knitted squares into blankets. It was a short two and a half weeks from first knitted square to blankets (except for Iris, who began knitting squares when she heard the words “knit-a-thon”). You go, girl! Many, but not all, of the squares were knit on board the Riggin this summer, with donated Hope Spinnery yarn, with the express purpose of sewing them into blankets to be given away. And then in the world of no coincidences, viola, enter the Knit-a-Thon in support of Ashwood Waldorf School! And it’s not too late to pledge and be entered for the J. & E. Riggin Knitting Cruise trip for two raffle. Tomorrow’s the last day! The blankets are beautiful and will go to New Hope for Women to hopeful embrace a woman or child who is in dear need of some tenderness and warmth. I’m so grateful to live within this terrific community. Trying to figure out how to get all of these gorgeous, but unusual-sized, square to fit together! Good job ladies!